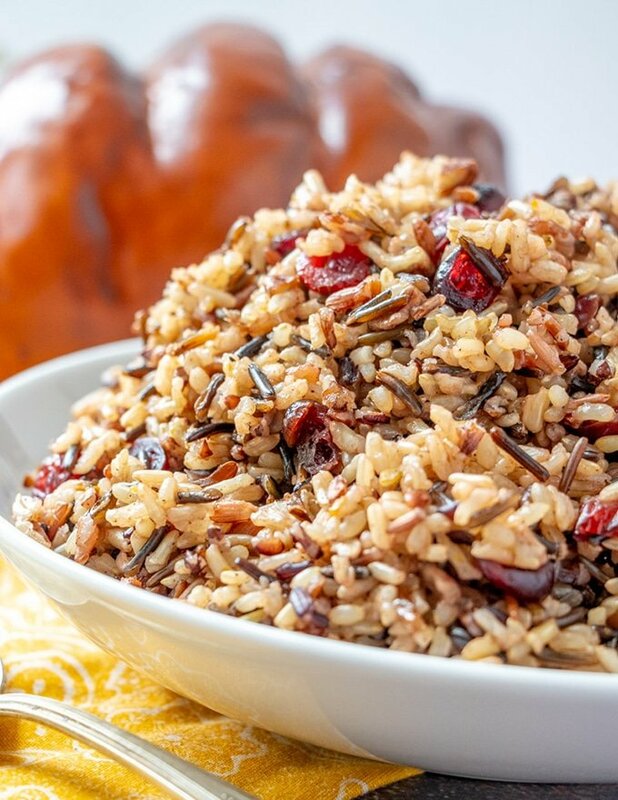 Cranberry Pecan Wild Rice Stuffing is a festive addition to your Thanksgiving celebration. 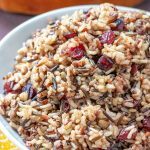 Loaded with tart cranberries, toasted pecans, and orange zest, it makes a fantastic side dish or turkey stuffing. Looking for a special dish to complete your Thanksgiving feast? 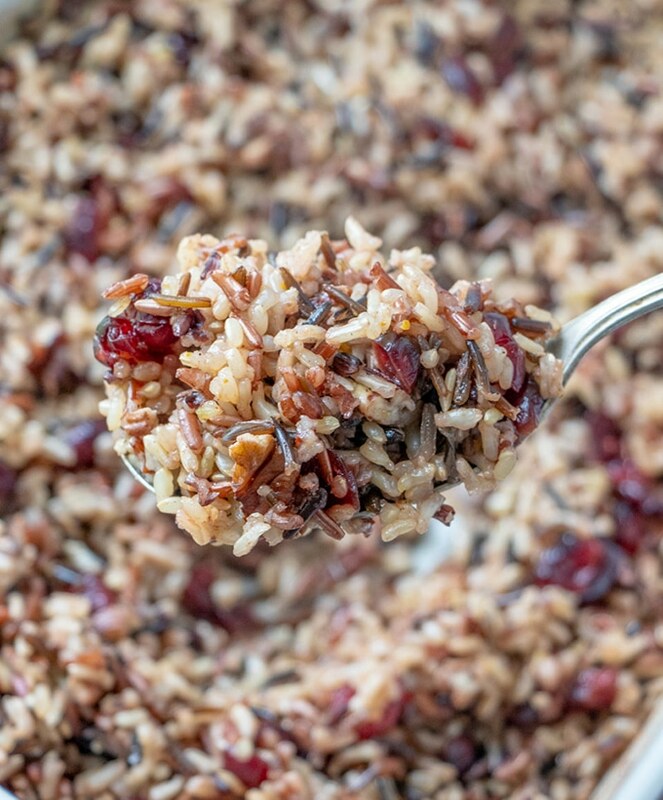 This cranberry pecan wild rice stuffing deserves a place on the dinner table alongside your holiday roasts. It makes for an amazing side dish as well as a flavorful turkey stuffing. 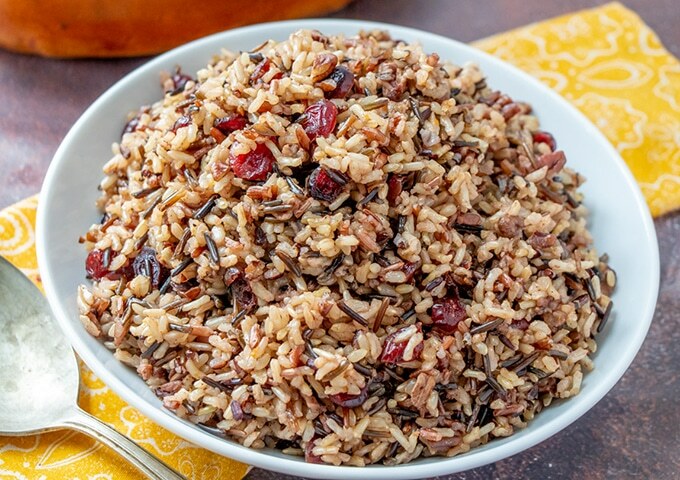 A delicious medley of wild and long grain rice, tart cranberries, crunchy pecans, and delicious hints of orange and cinnamon, it’s brimming with festive colors and Fall flavors your guests will beeline for! 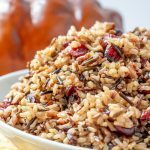 Cranberry and pecan wild rice casserole is not only a tasty addition to your Thanksgiving celebration, but it’s also a fuss-free side dish with easy prep and a short list of ingredients. 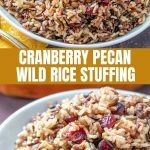 Just combine the wild and long grain rice, broth, orange juice and zest in a baking dish, bake in the oven until tender and fluffy, and stir in the cranberries and toasted pecans at the last 10 minutes of cooking. Exactly what you need for a busy holiday dinner! 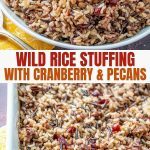 I usually make my wild rice stuffing with cranberries and pecans but feel to swap or add your choice of nuts and dried fruits. 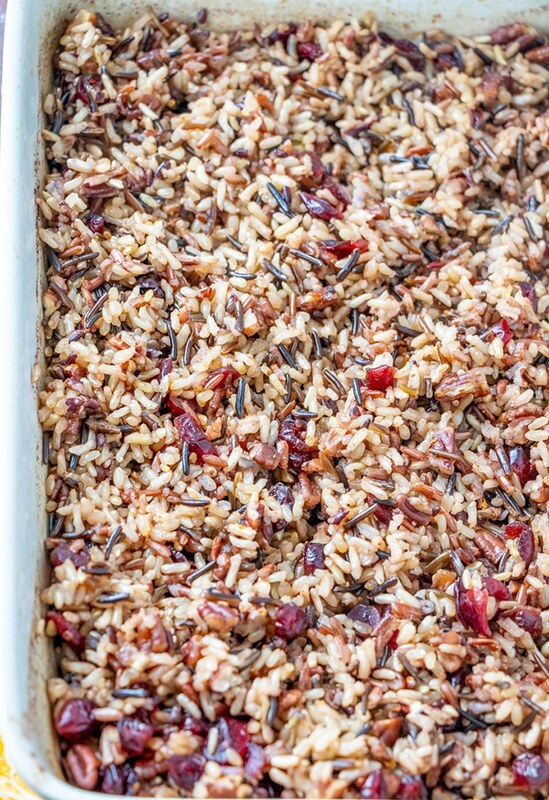 This wild rice bake is a great canvas for your favorite add-ins! Make sure to check out my suggestions below on how to make it your very own special side dish. Don’t like pecans? Swap with walnuts or almond slivers. Kick up the festive color with chopped dried apricots or golden raisins. Add diced apples and celery for extra crunch. Just saute in a tablespoon or so of butter until tender-crisp and toss in with the cranberries and pecans at the last 10 minutes or cooking. Cremini mushrooms are delicious additions, too! Sweat the mushrooms in butter (make sure the liquid they release is completely absorbed or it will affect the consistency of the rice) and combine with the rice to bake. Amp up Fall flavors and stir in roasted butternut squash cubes when the rice is ready to serve. Make it more hearty with bacon or turkey sausage crumbles. Brown the bacon or sausage, drain excess fat and add to the rice casserole. Want a more nutty flavor? 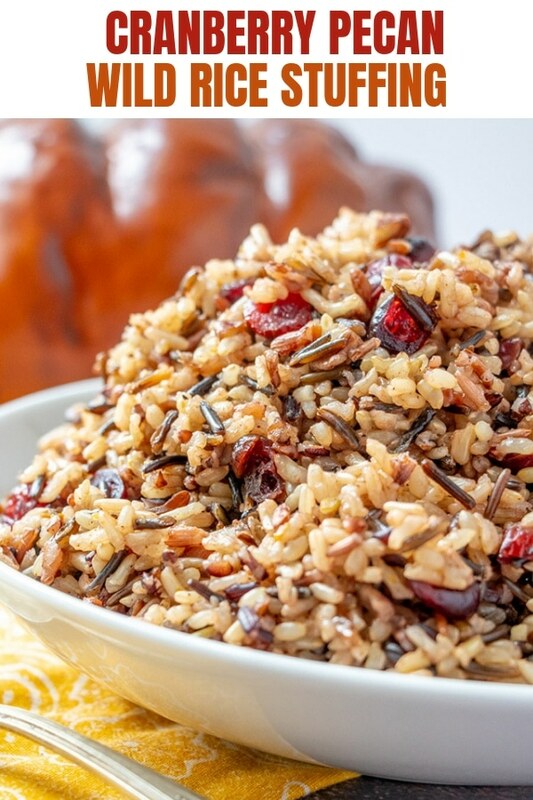 Replace long grain white rice with brown rice and add an additional cup of broth. Turn it into a scrumptious vegan side dish by substituting vegetable for the chicken broth. 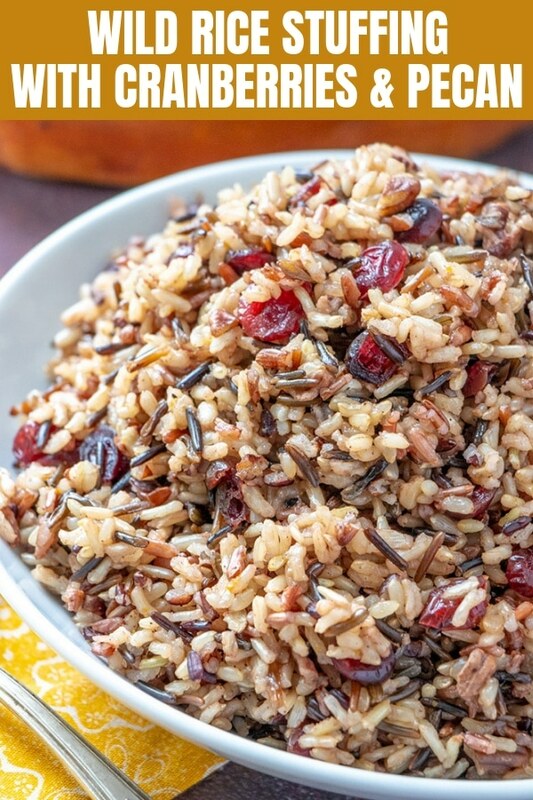 In a 9 x 12 baking dish, combine wild rice, long grain rice, broth, orange juice, orange zest, cinnamon, salt, and pepper. Cover tightly with foil and bake in a 350 F oven for about 1 hour or until liquid is absorbed and rice is fluffy and tender. Gently stir in pecans and cranberries at the last 10 minutes of cooking and return baking pan to oven. 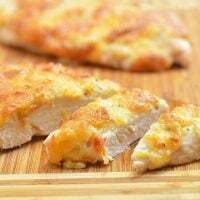 Remove from the oven and allow to stand for about 8 to 10 minutes before fluffing with a fork. Serve hot. I would like to try this as a turkey stuffing. Do i bake it first and then stuff the turkey, or just mix the ingredients and let the rice absorb the fluid while its in the turkey? I’d cook the rice mixture first before stuffing but it’d be a good idea to decrease bake time for a few minutes. You’re welcome 🙂 Enjoy the recipe! 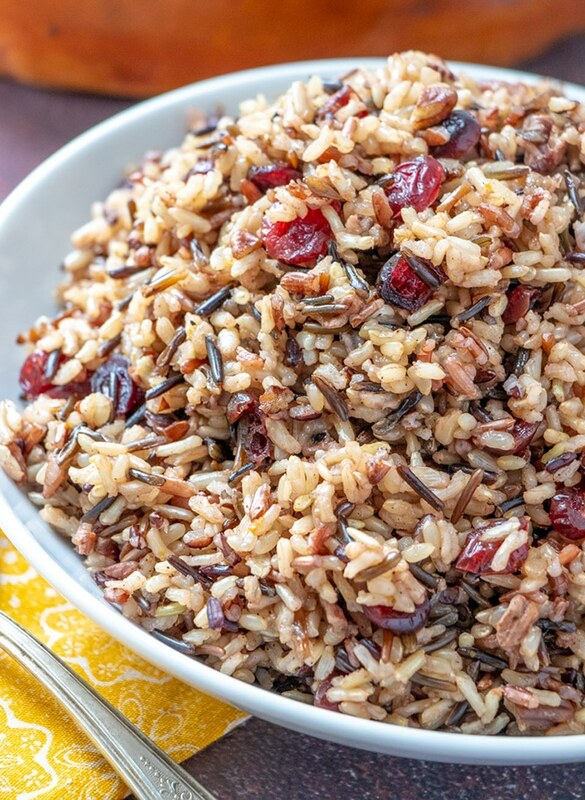 This looks fantastic, but I can’t eat wild rice – do you think jasmine rice would work well? Also, I’m betting this would be a terrific instant pot recipe, as everything goes in at once. I’m going to try this real soon. Thank you! Jasmine rice (or brown rice if you want to have the same nutty texture) will be a good substitute. Just decrease the amount of liquid (I usually use 1 cup rice to 1 1/2 cups liquid ratio for Jasmine rice) and adjust cook time. Please let me know how this turns out in the pressure cooker! My oven space is limited, do you know of an equivalent cooking time in a crock-pot? I am sorry, I haven’t tried this in a crockpot. I’d say maybe 3 to 4 hours on HIGH? It looks so delicious and really tempting. 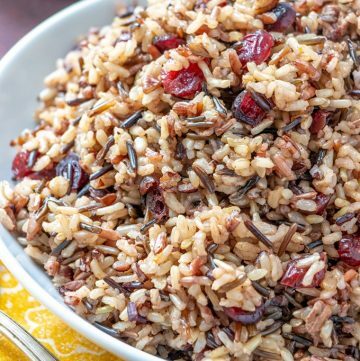 Cranberry in rice is such a great and smart idea. I will definitely try this one. For sure my twins will love this so much. Thanks, Elizabeth. I am sure they’ll love it! 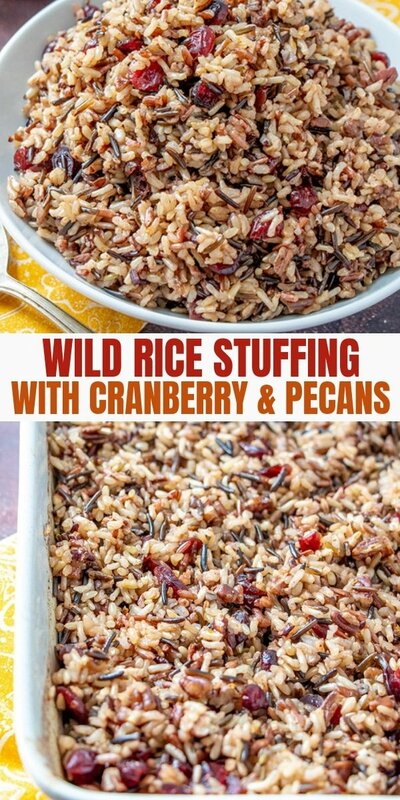 The Cranberry and pecan wild rice stuffing sound really interesting. This would be a switch from the traditional bread stuffing at Thanksgiving dinner. I will have to make this recipe for sure for my family. Thanks for sharing the recipe. This looks super yum! I might try it on my meal plan this month! 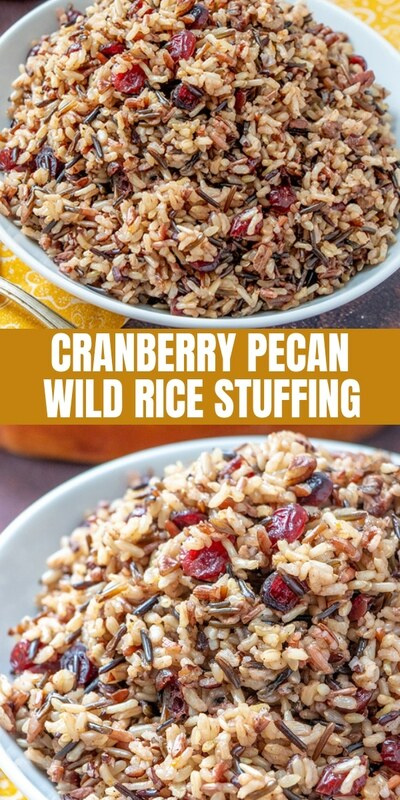 I’ve never been a fan of stuffing, but this with the rice looks yummy! I haven’t had rice stuffing in years. I certainly want to try out your ASAP. It looks amazing.